The Argentine ant (Linepithema humile) A highly invasive ant that is now widespread in the North Island. and out-competes our native skinks. It now occurs throughout the upper North Island. We do not have either at Gulf Trees here at Awaawaroa Bay, and we are doing everything we can to stay free of them. This means being extremely vigilant when we bring potting media into the nursery, as both can be transported this way - the ant by moving a fertile queen, and the skink by moving some eggs. Both can similarly move from one place to another in potted plants. At Gulf Trees we do not bring in potted plants, mainly because we grow all our own here, and anything we do bring in must have an Organic Certification. So in reality this never really happens. Another reason for being extra vigilant about these pests is that we often send plants to other Hauraki Gulf islands. These are largely free of these pests, and DOC, Auckland Council and concerned landowners are doing everything they can to keep them that way. To this end we are extremely vigilant as we go about the nursery. We have seen these species elsewhere and know what to look for. Most importantly, we have expert help in the Auckland Biosecurity team. Any order leaving Gulf Trees and going to a pest free area is checked by the team, notably by Brian Shields and his dog Rhys. 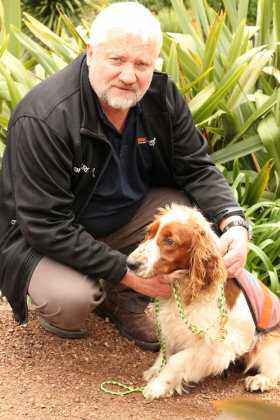 Rhys is the only specially trained Argentine ant detecting dog in New Zealand. So far they have detected nothing. Brian recognises the importance of having a pest free nursery and says he would act immediately if anything turned up, and attempt eradication. Brian has also checked out our off-island suppliers, to make sure do not harbour these pests. If you are buying plants for an Argentine Ant/Rainbow Skink-free area, or if you are concerned about them, please contact us to get an update on our status here at Gulf Trees.